The Society today . . . What do we do well? 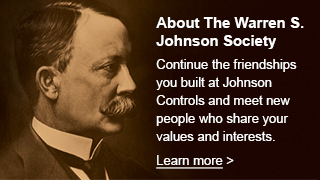 The WSJ Society is a social group of people who share career experience at Johnson Controls. We have over 530 members and benefit from a very good relationship with Johnson Controls. The society has been in existence for 25 years. For more detail, check this WSJ Society Summary. At this time the society is engaging in an exploration of opportunities for its future. Let’s call it Vision/Forward, an exploration into what’s possible. What has the society done well? When were you most proud to be a member? What do you value most about being a member? Please send your ideas to help move us along in a good direction — see contact info below. “Vision/Forward” will replace “From the Editor” on WSJSociety.com as we develop our Vision/Forward. I’ll report on your responses and other research results from this page. So please check back. Each page of Vision/Forward will be used to address a topic of value to our discussion. They will be updated as the discussion of the topic develops, so check back to each topic of interest to you.